Prices and values on the Lootaku website are given US dollars. A one month subscription is $44.99 (three and six month subscriptions are cheaper). According to my currency converter today this is £35.34 UK Shipping is $17.66 (£13.87). Slightly pricey, but this is a premium box. Also it’s coming a long way and it’s a big box! So a 1 month subscription is going to cost you around £48. 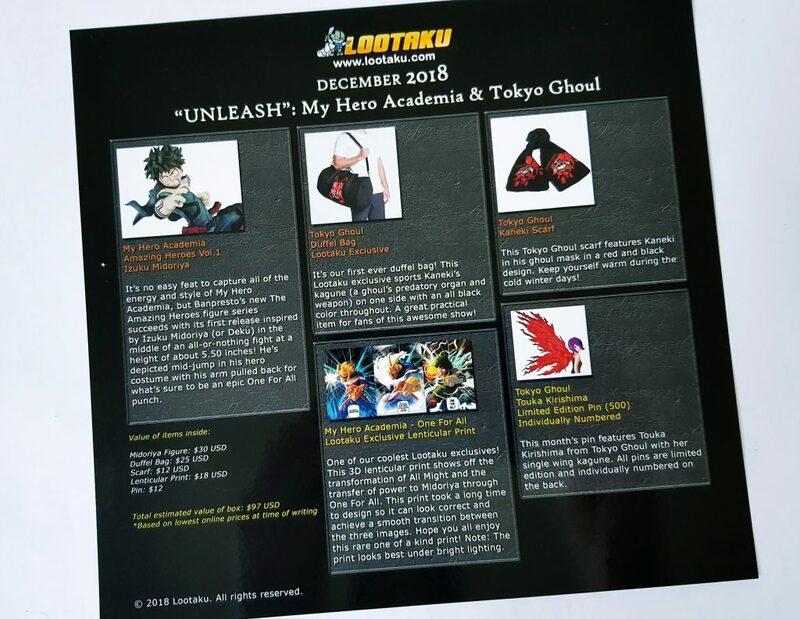 This month’s box features two franchises: My Hero Academia and Tokyo Ghoul. Tokyo Ghoul is a new one on me, but it looks like a pretty good dark anime series! 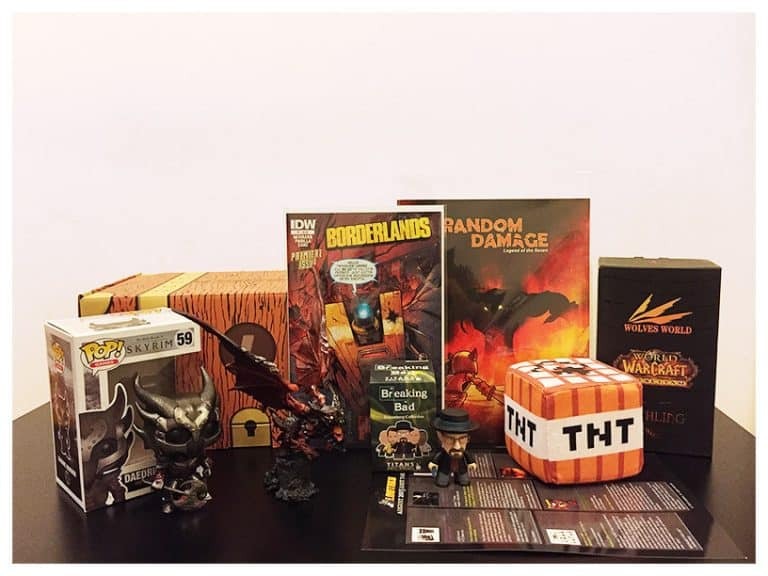 The shipping box looks like a treasure chest! Like last month, there’s just one figure in the box. 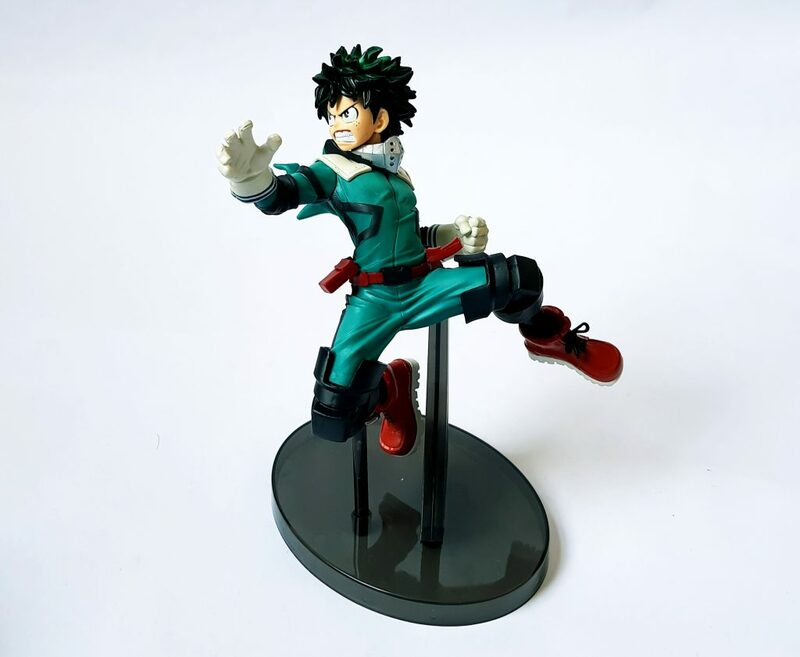 It’s from the new Banpresto The Amazing Heroes figure series. 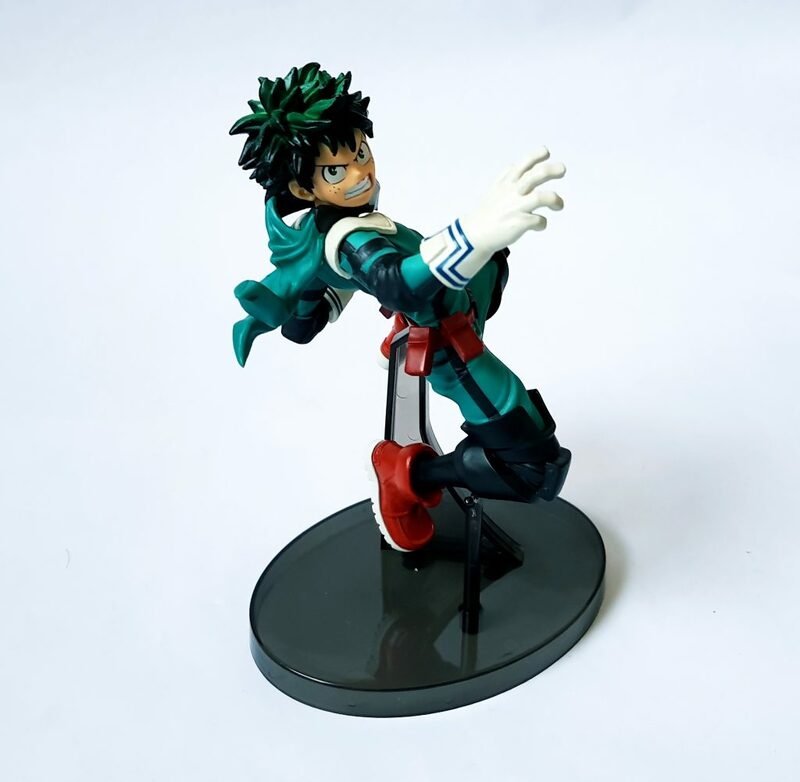 This is Izuku Midorya from My Hero Academia Amazing Heroes Volume 1. 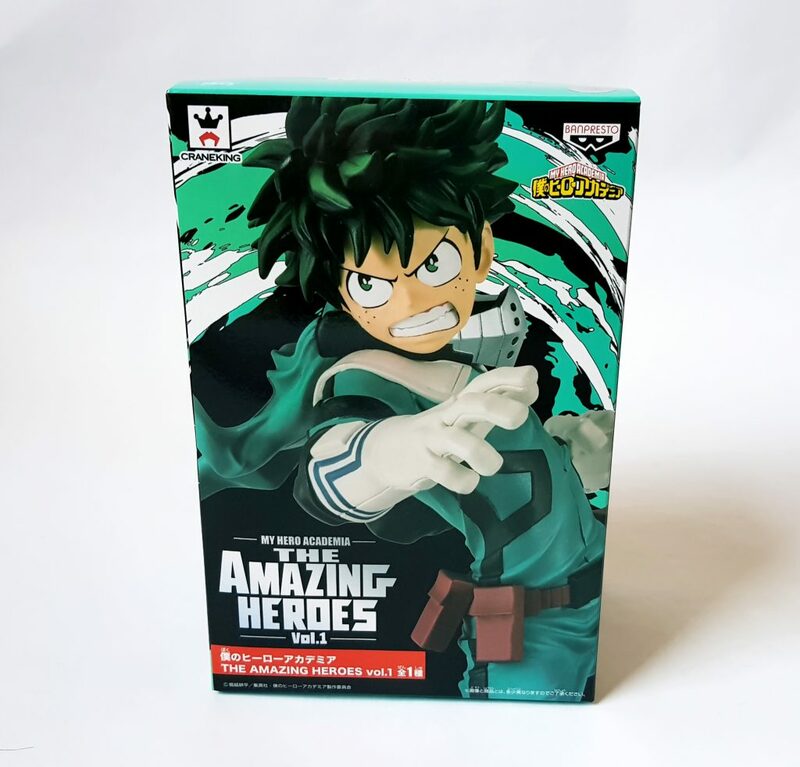 This is an early bird figure too, it’s not expected to be released until February 2019. It’s a great dynamic pose showing him jumping in the air in the middle of a fight! 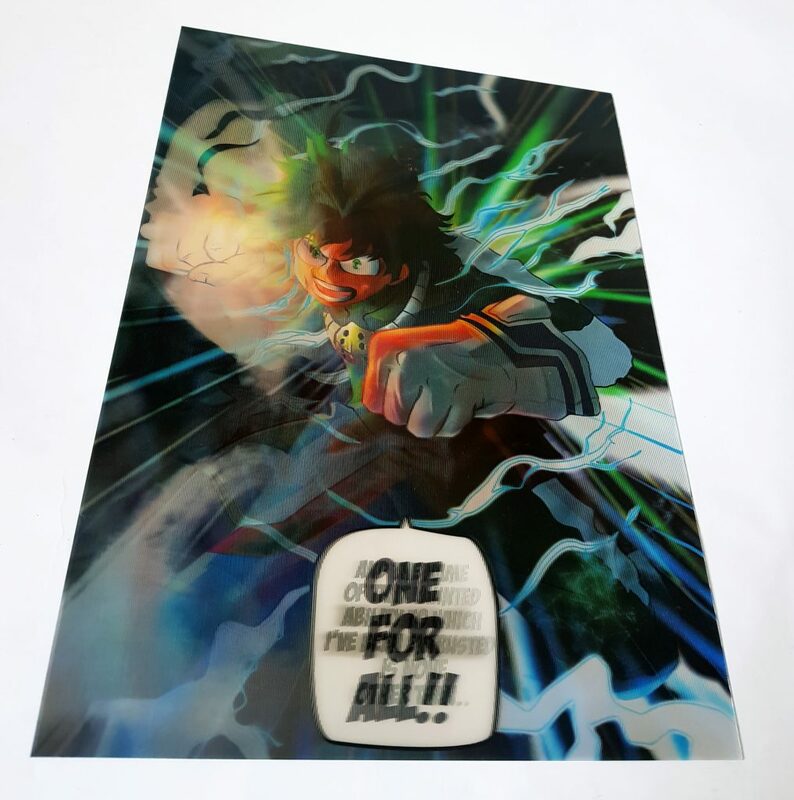 The second My Hero Academia item is this remarkable Lootaku Exclusive Lenticular Print. Lenticular prints are those images that look like they’re moving or transforming depending on what angle you look at them. 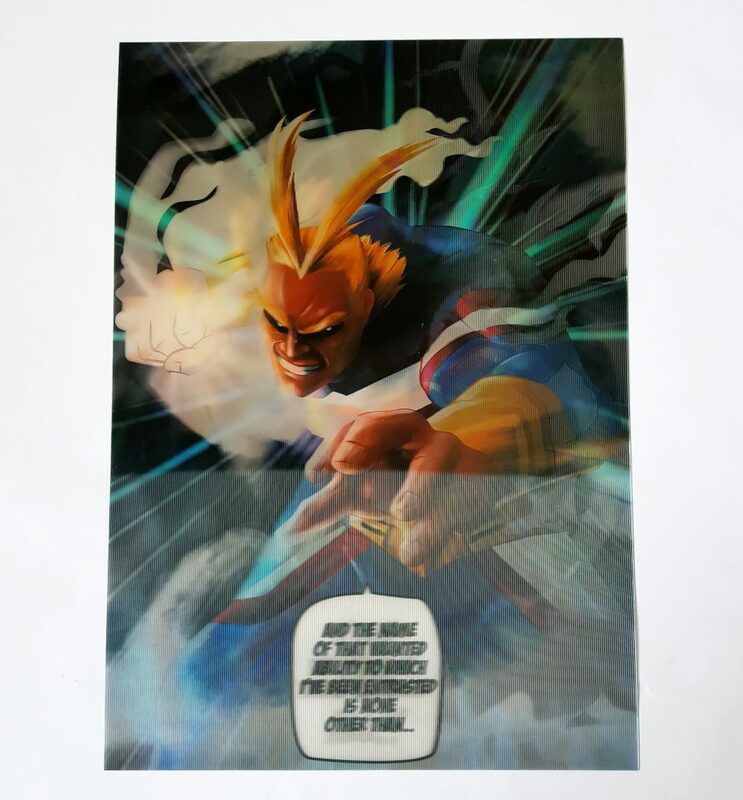 This shows the transformation of All Might and the transfer of power to Midoriya through One For All. It’s a little tricky to photograph, but this should give you some idea of the three different pictures. It’s actually really impressive close up seeing how the picture changes as you move it. 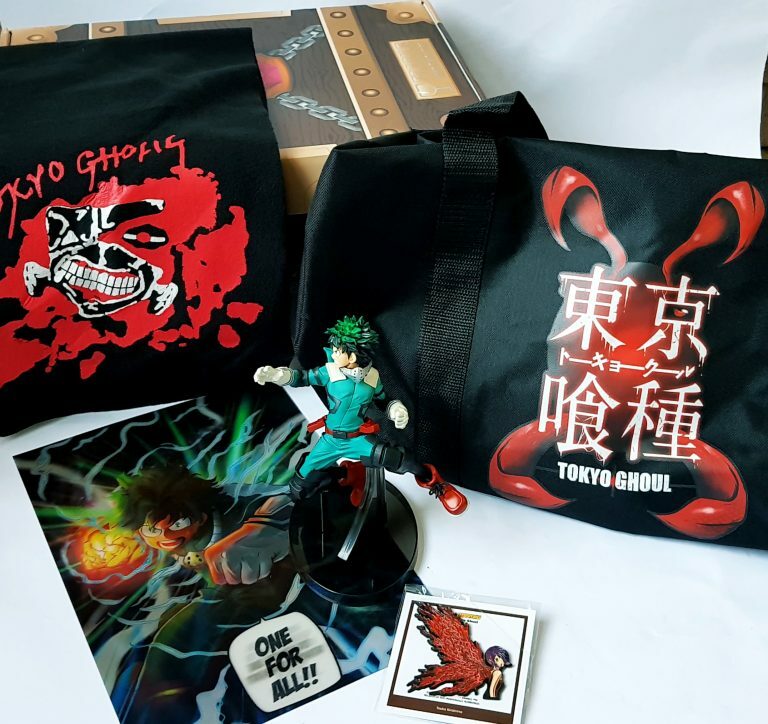 The other three items are all Tokyo Ghoul. 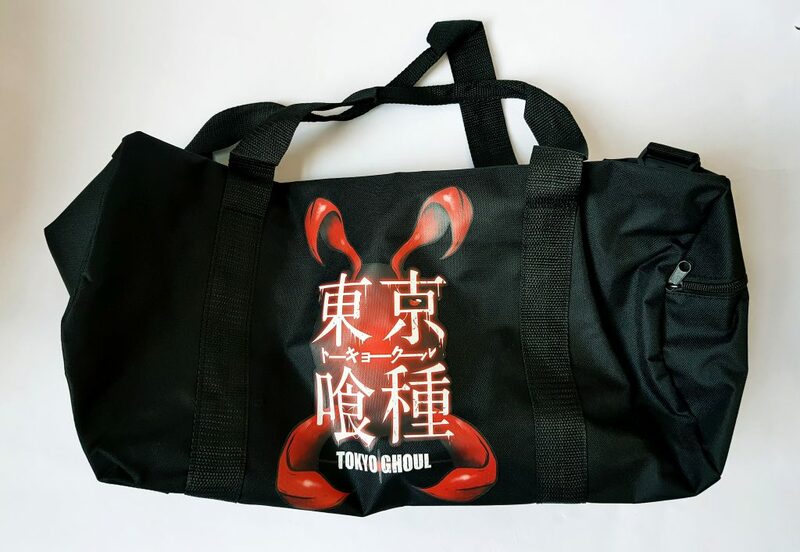 A Tokyo Ghoul Duffel Bag. This is a pretty cool bag, it’s got a detachable shoulder strap and an extra zip pocket at one end. 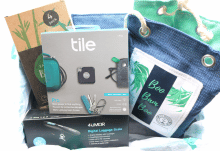 It’s a good size for a gym bag or overnight bag. 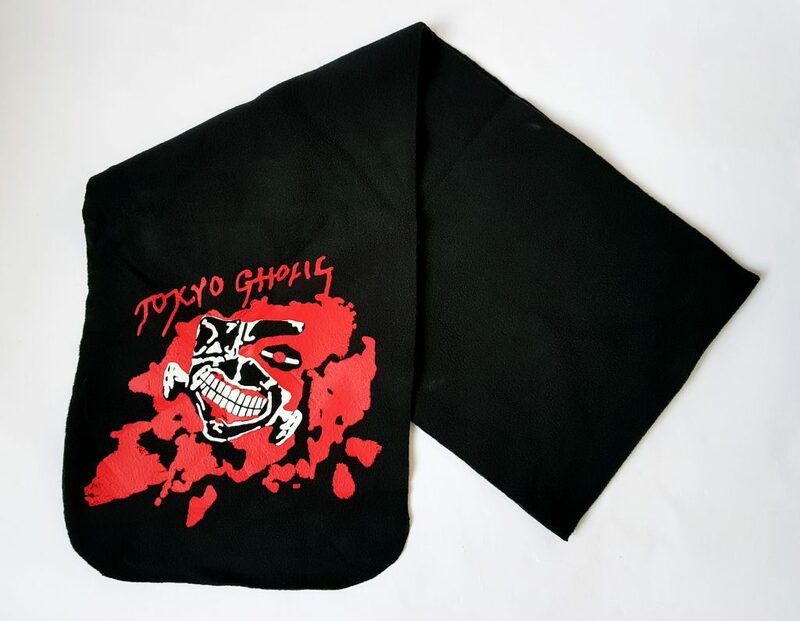 A Tokyo Ghoul Kaneki Scarf. This is made from snuggly fleece, great for keeping the winter chill out! 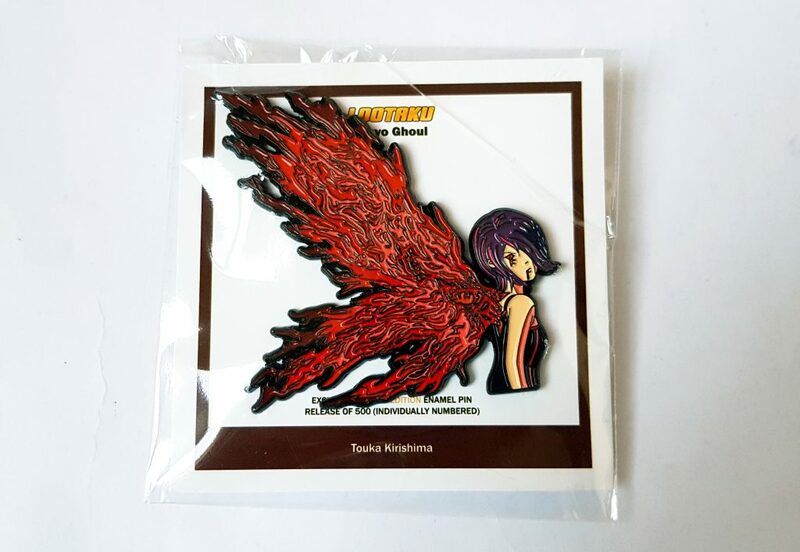 Finally, a Tokyo Ghoul Touka Kirishima Limited Edition Pin. This shows Touka Kirishima with her single wing kagune, and is one of a numbered limited edition of 500. The detailing on this pin is really very good indeed. The box price is around £48. But this is a slightly tricky box to assess for value, because three of the items are exclusive. The figure I found for £21.99 to preorder at Forbidden Planet, but there’s also a delivery charge of over a fiver. 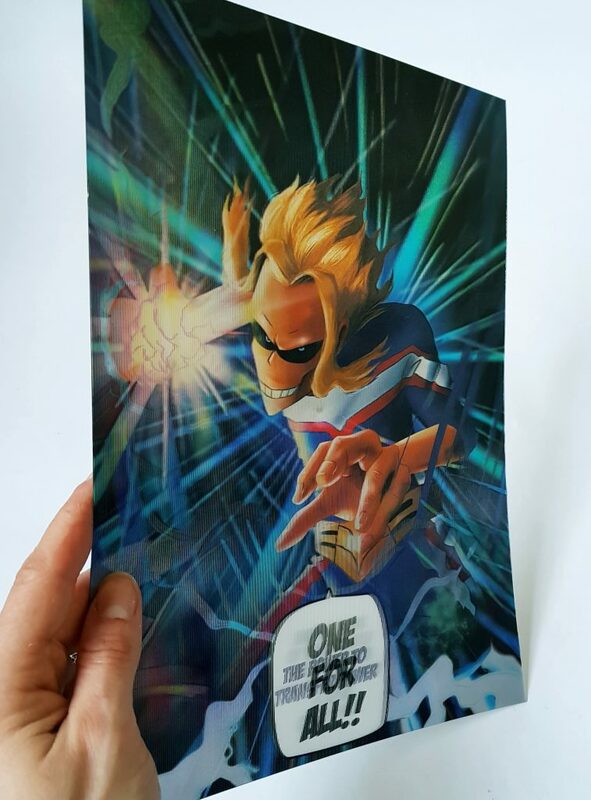 The lenticular print is completely exclusive. It’s pretty difficult to judge, the menu says $18 and it’s really cool so I’m going to value it at £12. The scarf is quite hard to find, but it was on an international site for $17.38 so I’m going to say £12. The duffel bag is an exclusive so tough to call. The menu says $25 so I’m going to put it at £16. I usually estimate the pins at £5, but as this is a little oversized so I’m going to say £6. Well, that’s a notional total of around £73. 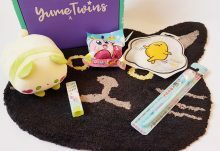 I really like the accessories in this month’s box. 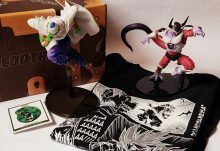 Lootaku always has excellent figures, and they’ve been very good this year at throwing the odd curveball into the boxes with non-figure items. The bag and scarf are actually very useful as well as fun, as I think geeky stuff should generally be practical. The lenticular print is really very good. The quality is fantastic, the transition is very clear, and it’s a really interesting thing to have on your wall. It’s plastic but not too thick, so it could easily be framed. Lootaku has done a great job this month mixing it up and giving you some cool options for wearing your fandom!